So begins the Easter Sermon of the Golden Mouth (his nick name) Byzantine preacher Saint John Chrisostom. He is writing to the faithful, some very committed and others not so committed, to join in the Paschal feast. A Feast which Christians borrowed from the Jewish People and inserted their own experience with the Risen Lord Jesus. The old feast was a feast celebrating freedom from slavery and death. The new feast celebrated much of the same but with Jesus as the Paschal Lamb sacrificed and offered once and for all time for the salvation, healing and renewal of all the people of God. Christians for centuries have celebrated this Feast starting with the Triumphal entry into Jerusalem, on Palm Sunday, and leading up to the passion, death, crucifixion and resurrection of this Jesus who was the new prophet after Moses. Today it is known as ‘Holy Week’. What makes this week so special? Holy Week is Celebrated only once a year. It always falls during the Springtime in the Northern Hemisphere. For Christians it is the most solemn and sacred celebrations of the year…our High Holiday! In our churches we imitate activities that have been taking place in the City of Jerusalem for some 1800 years, or maybe longer. We know this because of a travel journal written by the Nun Egeria who visited Jerusalem years after the death of Jesus and the destruction of the Temple in Jerusalem. Most of what we do today follows the same sequence of the events she experienced during her life changing Holiday in Jerusalem. Since few people can go to Jerusalem and live again the final days of the life of Jesus, these events have been re-membered and re-lived every year in local monasteries, churches and cathedrals since that first visit and they are celebrated every year. They have the same flavor and many of the same rituals that have gone on for centuries now. So, What are the highlights of Holy Week? Palm Sunday- The Procession with Palms and the solemn reading or singing of one of the Passions according to Matthew, Mark or Luke. Monday and Tuesday- Days of preparation remembering the last days of Jesus with his friends and followers before his betrayal. Wednesday- (in some communities) A Celebration of a Service of Darkness called Tenebrae. An ancient practice of singing Psalms, Antiphons, and Hymns related to the Passion as 7-14 candles are extinguished. 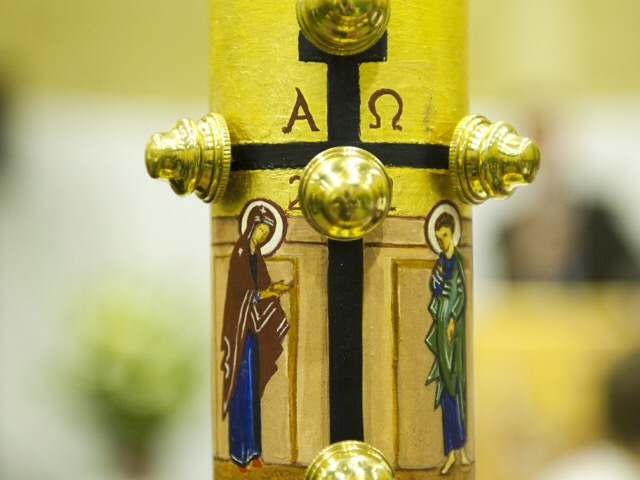 One is left, the Christ Candle. All depart in darkness after the loud ‘earthquake’. Thursday- The Washing of Feet as Jesus did at the Last Supper (a great sign of Christan Service and Humility to each other in the world) and a Mass of Thanksgiving for the Eucharist, the greatest gift left to his people after his death and resurrection…Holy Communion, blessed and consecrated Bread and Wine. A continual living memory and presence of the Risen Lord with his church until the end of time. This Service is followed with three days of silence and solemnity to observe the passion, death and burial of Christ. Friday- A day of solemn prayer, fasting and remembering the death of Jesus on the Cross. It combines readings of the Passion of Saint John, the Presentation of the Cross of Christ, and Prayers for the World, the Church, and the People of God. All churches, monasteries and cathedrals are bare this day in mourning for the man ‘Jesus of Nazareth’ who was executed and put to death unjustly. He would become the Risen Lord and Christ. Saturday- The Great Vigil of Easter, the queen of feasts. This is the invitation made by John Chrysostomos. So Holy Week ends in a huge party. Divided in different courses. Course 1. The lighting of the new fire and Easter Candle like the image in this article. Followed by the first Proclamation of Easter known as the Exultet. A kind of “we are the champions” anthem. Course 2. Listening to the great stories of our Salvation from death, sin and slavery. Starting with Adam and Eve, then Noah, then Moses, then Abraham and Isaac, then the Prophets. Course 3. Baptism and Renewing of our Baptismal Vows as a people saved by the waters of Baptism. Course 4. The Easter Gloria and alleluia that have been silenced for over 40 days in our churches so we can sing them again during the next 50 days of Easter. Course 5. The Easter Gospel and First Eucharist (Mass) of Easter. We partake in the Bread of Life, the promise of our own Resurrection from the Dead. The Easter Feast continues on for 50 Days until the Feast of Pentecost. By celebrating Holy Week year after year we Christians go deeper and deeper into the Paschal Mystery of life itself. Life and death are the great cycles all human beings share together. Hardship, Loss, Death that eventually is renewed and brought back to life is at the heart of our human existence. It is the eternal cycle of our existence which repeats itself over and over again. When we Celebrate Holy Week together in Community we too are reminded again and again that we are an intimate part of that mystery by means of our Baptism and our association with Jesus. How can I make Holy Week special and different? First, find the time and place to experience the drama, the worship, the liturgy of Holy Week. Also create a Holy Week space where you live. A place where you can sit and read, meditate and think on the mysterious events of the last days of Jesus on earth. Find a table, a chair, a candle, a cross, a table cloth, and a bible and anything else that might inspire you. Share some special meals for Holy Week. A Jewish Sedar with a friend or at a nearby synagogue. Easter Eggs and Easter Bread from a local bakery. Plan an Easter meal and a Good Friday meal. How might they be different? Share the meal with someone special. Find a Christian Community to Celebrate the Special Days of Holy Week. Try to attend as many services as possible to get the best flavor of the week. If you are home bound, try and find the Holy Week services on the internet or U Tube to watch and observe. Plan your entire week. What can you do during your free time Holy Week? How can you make the most out of the week? Spend Holy Week and participate more fully. So All are Invited to this Feast, there are no exceptions. Why? because all of us can share in the same Feast and Party of eternal life. All of us! Thank you for the beautiful history and knowledge of our Savior what a blessing it is to know and serve our precious Lord!